A Winter Weather Advisory will be issued for any amount of freezing rain, or when some accumulation of snow (alone or in combination with sleet and freezing rain), is expected to cause a significant inconvenience, but not serious enough to warrant a warning. A Winter Storm Watch is issued when there is the potential for significant and hazardous winter weather within 48 hours. It does not mean that significant and hazardous winter weather will occur…it only means it is possible. Enough ice accumulation to cause damage to trees or power lines. Life threatening or damaging combination of snow and/or ice accumulation with wind. Same criteria as a Winter Storm Watch (above), but imminent instead of within 48 hours. A Wind Chill Advisory is issued when significant wind chills are expected. A Wind Chill Warning is issued when dramatic wind chills are expected. For information about watches or warnings in Fort Bend County, visit the Weather.gov page for Fort Bend County. Check on the elderly and those who may have functional or access needs to make sure that they have sufficient warmth to get them through the cold weather. Make sure to properly use space heaters and fireplaces, ensuring that there is at least 3 feet of space around them while operating. Get safety tips from the Houston Fire Department Fire Prevention & Life Safety Guidebook. Watch for signs of hypothermia, which include uncontrollable shivering, memory loss, disorientation, incoherence, slurred speech, drowsiness and exhaustion. If you feel the person is suffering from hypothermia, get them to a warm location, remove any wet clothing and warm the center of the body first, giving warm, non-alcoholic beverages to the victim if conscious. Get medical help as soon as possible. If a persons’ body temperature falls below 95?, it is a medical emergency – call 911 immediately. 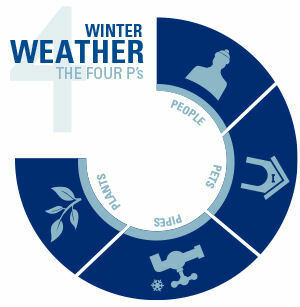 Avoid doing activities, such as exercising, outdoors when there is extreme cold. If you have to be outdoors, dress in several thin layers rather than one thick layer, cover your head to reduce heat loss, cover your mouth using scarf or mask to help warm the air before your breath it. When driving, be sure to remember that cold weather may cause highway overpasses and bridges to freeze. Take extra precautions when driving during cold weather. During extremely cold weather, pets should be kept indoors. Don’t shave your pet’s coat all the way down during winter, exposed skin can easily lead to hypothermia and frostbite. If your dog is short-haired, consider getting him a coat or sweater for the winter weather. Never leave your animal in a car during the winter. They can act as refrigerators and can result in hypothermia. While pipes generally do not freeze until the temperature drops into the 20s, pipes exposed to windy areas could experience cracking. 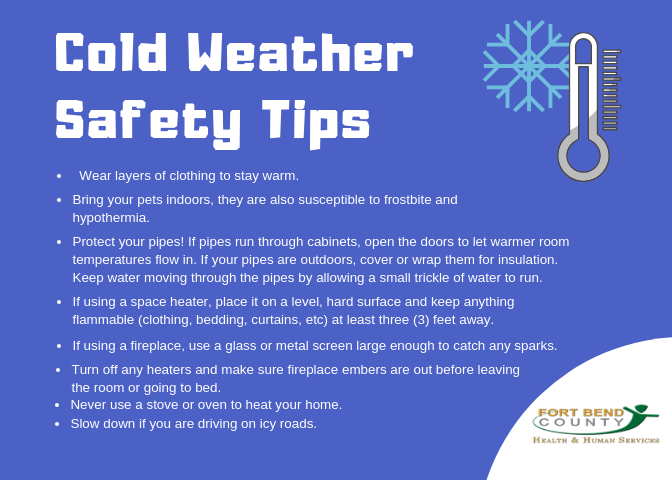 Be sure that pipes are properly insulated, wrap newspaper or clothes around outside faucets, or in cold areas of homes. Remember to protect and/or drain your sprinkler systems and garden hoses by shutting them off. If you think a pipe might be frozen (you open a tap and no water comes out), don’t take any chances, call a plumber and leave your tap open until they arrive. Also, turn off the water main to your house to avoid shifting ice and flooding. Plants should be covered on cold nights with fabric to help keep them somewhat insulated during a freeze. You can also create windbreaks around sensitive plants to keep the cold air from “burning” them. Keep your plants hydrated, which helps fight off drying due to cold winds.